December and January are down time months at the Meadowbrook Community Gardens and Orchards at the Seattle Parks site. Clearing out dead branches, removing wandering ‘invasive’ plants and selective pruning give the Edible Hedge a great start to Spring. Thank you Prunesters! So this February volunteers got excited to get the tools out, gloves on and take in the fresh air. 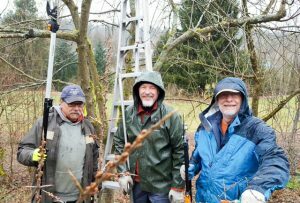 The Edible Hedge along NE 105th and parts of the North Orchard have been identified and volunteers looked eager to give the designated trees a trim. Sharing standard practices around pruning and changes coming to the Edible Hedge make it an exciting time. Sue M, who is the steward at the Community Gardens popped in to lend a hand. Having a knowledgeable, experienced and returning crew made for great results. With trail upgrades and enhanced bee sites this coming Spring, it looks like a very productive season. Additionally, there are two service visits this Spring. Both University of Idaho and Willamette University will send student groups to Seattle for a break from studies and offer a lending hand to MCGO.